Colorful fishing boats called luzzi clog Xlokk&apos;s bay, bringing a fresh catch to the many surrounding restaurants. RABAT, Malta — Lizards skitter over rocks and seashells, vestiges of a long-ago landscape far different from the dry hills filled with cacti and prickly pears that characterize Gozo today. That was the time when giants dwelt on the islands of Malta, at least according to legend. Who else could have raised stones nearly 20 feet in height as part of the twin temples known as Ggantija? The soaring slabs that combine in clover-shaped hallways and apses are even more impressive considering their vintage: Ggantija is an estimated 5,600 years old. That’s 1,700 years older than Stonehenge. It is earth’s oldest freestanding, manmade structure. Early archeologists may have jumped to the far-fetched conclusion that the island of Gozo (Ghawdex to locals) was once populated by giants, but researchers today don’t know much more about the neolithic people who built a countrywide cache of temples that were surprisingly high-tech for their times. Every corner of modern Malta holds traces of the history that formed it. Air Malta planes are decorated with the spirals that swarm the walls of ancient temples, while Phoenician-style boats appear in Coca-Cola ads. A trip to Malta is a thorough immersion into the distant past. At just 121 square miles, the islands of Malta, Gozo, and tiny, beachy Comino (and there are four ininhabited islands) constitute a unique country in the Mediterranean Sea that’s easy to explore. Using the capital city of Valletta as a home base, the main island is highly accessible by bus. A visit to one of the smaller islands requires only a short ferry ride. Below, we offer an abridged guide to making the most of a historic trip to the Maltese Islands. The same community that practiced its religion within the limestone walls of Ggantija buried its dead nearby at what’s known as Xaghra Stone Circle . Last year, Heritage Malta opened a sparkling new museum that is a short series of walkways away from the temple. Now branded Ggantija Archaeological Heritage Park, it showcases antiquities from both sites, and others around Gozo. A visit to the Gozo Museum of Archaeology in the Gozitan capital of Victoria is still worth a jaunt to see vestiges of Roman and medieval life on the island, but its greatest prehistoric treasures have been moved to Xaghra. Most compelling is a collection of tiny busts of men with pageboy haircuts. The refined statues surprise the viewer with clearly carved eyes, lips, and even jewelry. Other sculptures found with the dead in the Xaghra Circle include rotund women in pleated skirts. Sometimes they’re portrayed in pairs, sometimes alone, but almost always without heads. It’s not uncommon to see replicas sold in tourist shops as candlesticks, with candles taking the place of the absent heads. In a more personal look at the people who lived, worshiped, and died in Xaghra, scientists performed a CT scan on the skull of a young woman buried in the circle. A computer reconstruction of her face makes its point: Her swarthy beauty would fit in seamlessly with her modern neighbors. 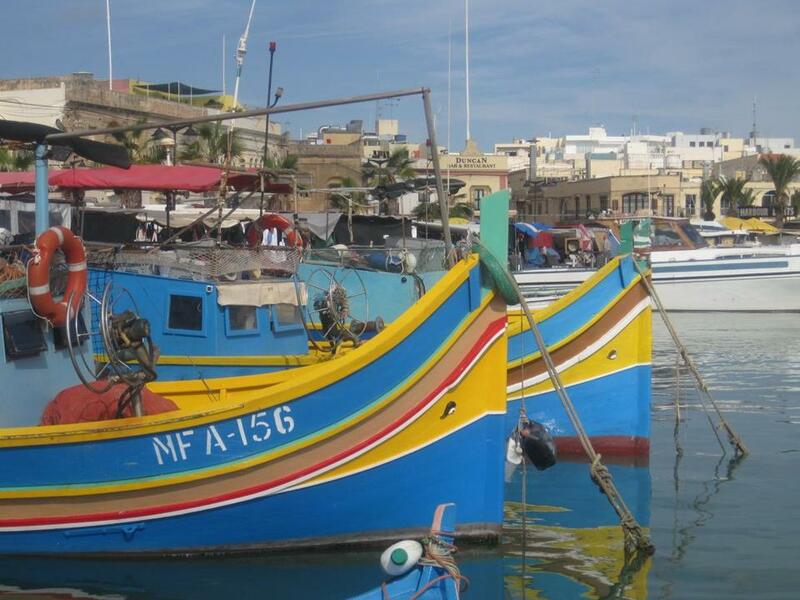 On Sunday, locals line up for the weekly fish market on the shores of Marsaxlokk. The catch makes it from ocean to plate in fishing boats called luzzi, still painted with the Technicolor red, blue, and yellow stripes, and watchful eyes that decorated them in Phoenician times. The foreboding stares have been carved onto the sturdy little fishing boats since around 1000 BC. After a seafood lunch, a short walk (or bus ride) south to Birzebbuga transports guests back more than 500,000 years, to the cave known as Ghar Dalam , or “cave of darkness.” The old-fashioned visitors center is filled skeletal-cheek-to-jowl with the remains of extinct hippos, deer, and dwarf elephants, all small enough to have survived the ice age in the cave. Inside the cavern, strata are marked to show which animals lived there in each era, from the hippopotami that became extinct close to 180,000 years ago to the final layers, about 7,500 years old, which host traces of human residence, including pottery and jewelry. Two megalithic temples, Hagar Qim and Mnajdra, are in nearby Qrendi, but after a full day of ancient history, the modern appeal of Valletta and its dining and shopping may be calling to you. Malta’s early Christian catacombs in the suburb of Rabat are an uncommon sight, well worth a detour. But the town of Paola’s underground necropolis has no parallel. Beginning around 3300 BC, the Hal Saflieni Hypogeum was painstakingly carved using little more than shards of sharpened bone. Hal Saflieni is no casual assemblage of graves. It’s a subterranean photo negative of the prehistoric temples above ground, a holy place for departed ancestors to live in the underworld. Upstairs is a small-and-sterile museum with a short background on the site’s 1902 discovery. But the modern-day trappings upstairs melt away underground. Music by local percussionist Renzo Spiteri recorded in the underground chambers captures the eerie echoing in the deep reaches of the earth, along with the sound of bone chipping at stone. A few walls still betray traces of red ochre spirals painted 5,300 years ago. Other funerary art was buried in dark earth along with loved ones long ago. The most famous, known as the “Sleeping Lady,” reclines in the sideways position observed in many contemporary burials. Other relics were carved from alabaster probably imported from the Italian mainland. Several of these are on view at Valletta’s National Museum of Archaeology. For prehistory sleuths, that museum is the only notable destination in the romantic, limestone-covered capital, but the opulent 16th-century St. John’s Co-Cathedral and Knights Hospitallers’ Sacra Infermeria shouldn’t be missed. There is no museum and little fanfare at the temple complex in Tarxien, a short walk from Hal Saflieni. But the trio of interconnected places of worship reveals several clues to the religion that built them. One altar was discovered filled with animal bones and a flint knife, clear evidence of animal sacrifices. There’s also evidence of cremation. The temples’ most valuable artifacts now reside in the National Museum of Archaeology, but the replica of a larger-than-life goddess statue (just her legs and skirt were unearthed) looms large in both girth and significance. Some giant building blocks are decorated with spirals, while others feature livestock, including sheep and a pig. This most complex temple site in Malta has another notable feature: While guests stroll the ancient paving stones, the view in one direction is of the clover-shaped temple apses. The other view is of a modern cemetery, filled with recent burials and a population of feral cats. It’s a compelling reminder that just as history lives in Malta, the living will soon become history. Alice Levitt can be reached at alice@sevendaysvt.com.